Discover How You Can Improve Learning, Concentration, Short Term Memory And Behavioral Challenges… Without Expensive Therapy Sessions Or Medications With Potentially Harmful Side Effects. Maybe you or your child are suffering from learning, concentration, behavioral or emotional issues that are affecting their self-confidence and ability to realise their full potential? 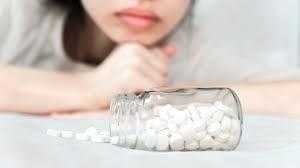 Today, millions of children take daily medications that include anti-depressants, anti-anxiety and anti-psychotics for emotional and behavioral challenges. And adults aren’t faring any better. But these medications can often come with the high risk of dangerous side effects and can often lead to long term addiction. Happily, now there’s a much safer and natural way to obtain lasting relief for a wide range of learning, behavioral, and emotional issues through our groundbreaking Sound Therapy Listening Program. It may surprise you to learn that by simply listening to specific sound frequencies combined with music you can receive many positive benefits. Sound therapy has been proven to reduce stress and anxiety, improve learning abilities, increase focus and concentration, improve short-term memory loss and promote an overall sense of well-being. And if you think that sound therapy is just another “New Age” fad…. think again! Sound Healing Has Been Around For Centuries! The ancients knew that sound can positively influence the health of the mind and body dating back thousands of years and there are countless references to the healing power of sound within every religion. Tibetan monks use the frequencies of singing bowls and the Egyptians used vowel sound chants for healing. Recent studies have now shown that chanting creates many positive physiological changes in the body, and can also promote calmer and more serene emotional states. Buddhist monks played Tibetan Singing Bowls for over 2500 years. The monks meditated on the beautiful sounds the bowls produced to quiet and heal the mind. Egyptian priestesses used a “sistra,” which is a musical rattle instrument with metal discs that creates a jangling sound that generates large amounts of healing ultrasound. Sound therapy is used daily in mainstream medicine and includes Ultra-Sonics to stimulate healthy bone and tissue growth and to carry out baby pregnancy scans. Extracorporeal shock wave lithotripsy is the most common way of treating kidney stones. Sonography uses high frequency sound waves to produce visual images of tissues, organs and blood flow inside the body and tuning forks are often used for reflex responses, hearing, bone conduction. Now with cutting edge sound technology combined with music, we have made it possible for you or your children to achieve remarkable benefits with The Sound Therapy Listening Program. Learning problems don’t only impact the school performance of children and adolescents, they can also lead to lower self-confidence and self worth as they often lose belief in themselves. In fact, they often feel so discouraged, they stop trying altogether which often ends with family distress and unhappiness. The Sound Therapy Listening Program helps improve learning and behavioral issues by speeding the brain up or slowing it down in times of overthinking and stress. The program uses cross hemisphere co-ordination to create new neural connections and focuses the brain to keep it on track. This improves concentration, focus and accelerates learning capacity. In studies its been shown to be highly effective for children and adolescents with Dyspraxia, ADD/ADHD, Dyslexia Asperger's Syndrome and other learning challenges. The Sound Therapy Listening Program has also been shown to improve Auditory Processing Disorder, which is when children and adolescents struggle to follow instructions, listen to what’s being said, or need extra time to answer questions. We created the most engaging musical tracks to ensure restless children don't get bored and stick with the program. Parents tell us that even previously resistant kids enjoy The Sound Therapy Listening Program and complete the levels they need to better themselves without having to be constantly reminded, which ends up being a hassle. The musical tracks are non-vocal so the language centers of the brain don't get caught up in lyrics and distraction. Whats more is that children and teens can listen to the tracks while they’re studying or doing other tasks, which makes listening easier and further aids their learning. As children experience higher functioning and behavioral issues are resolved, it often leads to less stress and a happier family environment which is the goal of MindSounds and its creator. Our groundbreaking Sound Therapy Listening Program was designed for children, adolescents and adults to focus the brain and keep it on track in the midst of countless distractions, while improving concentration, memory and learning abilities. The Program Is Fun And Easy To Use! 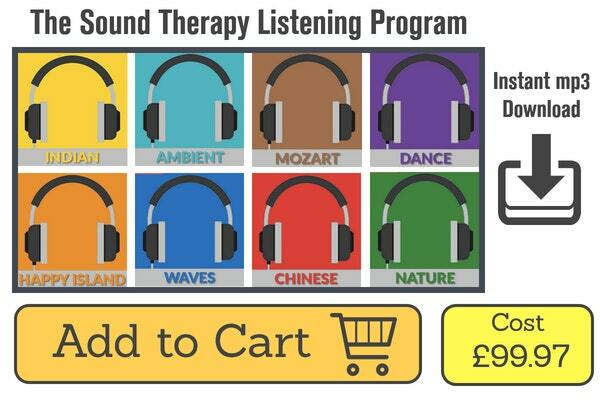 The Sound Therapy Listening Program is easy to use and includes 5 progressive levels with 8 musical tracks per level to choose from, so there is plenty of choice. Every track on a level has a different genre of music to choose from so you can customize the program to suit your musical preference. That's 40 different tracks throughout the program, which ensures you and your child have an incredible array of exciting musical choices so you don't get bored! The difference in each level is the intensification/speed of the powerful sound therapy that is underneath each music track. The music is there to keep you engaged whilst the sound therapy does all the work behind the scenes. So, no matter how busy your schedule, you’ll be able to listen to the program while commuting to work, walking around, working out, relaxing or reading and studying. We know that positive progress is often achieved quickly and users can move from Level 1 to Level 2 of the program in only two weeks. It typically takes 10 weeks to move through all 5 Levels at that pace, but some users choose a longer period of time and use the program 20mins or more each day. It depends upon the individuals choice as you can not overdose on the program and can always change the usage to what works best for you and your situation. Rest assured, it’s 100% safe for all ages, completely natural, fast acting and without any risk of dangerous side effects. How Can Simply Listening To the Tracks Provide So Many Benefits? You’ve probably noticed how the power of certain sounds create positive emotions in your own life. Your mind and body react in a different way to a lovely melody or soothing waves breaking on the beach, but the unrelenting noise of a car alarm or hammering at a construction site can jangle the nerves. Ever wonder why your favorite song makes you feel so uplifted? We know through quantum physics that everything is composed of patterns of unseen vibrations which are groups of frequencies and they’re constantly changing and responding to our environment. From the movements of the planets to the beating of your heart, every atom, cell, tissue, organ and bone in our bodies is vibrating and that vibration produces sound, whether or not the sound is audible to the human ear. When you’re in a state of health and vitality, you are actually vibrating at a specific rate and in harmony, however, when you become stressed, sick or simply feel out of balance, your frequency changes, literally causing internal and external dis-harmony or dis-ease. Physical, mental and emotion problems are a result of these natural frequencies getting out of balance and Sound therapy works by returning the body’s frequency to its natural balanced state. 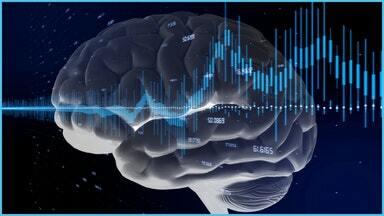 What is interesting, is that this is not some pseudo science as there are over 30,000 research papers that show the effect that sound has upon our brainwave states which can be measured using an EEG machine. This is the way in which we use the Sound Therapy Listening Program to gain maximum benefits to the user. What really makes us tick? How do we know? And what are the implications for our health? One of the most intriguing roads that leads us into the world of vibration—and there are many—emerges from the leading edge of physics, where scientists are still debating what the world is really made of at the most fundamental level. Greek philosophers over two thousand years ago proposed that the basic, indivisible unit of matter was the atom (a word derived from atomon, meaning “that which cannot be divided”). The idea was revived in the eighteenth century. By the 1930s, physicists had discovered that the “atom” could be broken down into smaller components—a nucleus, which is made up of protons and neutrons, orbited by electrons. In the 1960s, physicists uncovered still smaller units—dubbed “quarks” and “leptons”—that make up all particles of matter. But in the last several decades, some physicists have claimed that there is yet another layer of the onion to peel off, and that under it, at the very core, lie the real building blocks of matter—strings of energy. Before the birth of atoms, before protons, neutrons and electrons, there is…the vibrating string of energy. This theory, popularly known as string theory or superstring theory, is one of the newest upstarts in science. It was first introduced in the late 1960s and is now a popular field of study. Called by some the Wild West of physics, string theory claims that everything in our universe, from the planets swirling through space to the tiniest subatomic particle, is at its most basic level made up of microscopic strands of energy. This conclusion has important implications for our understanding of why energy, sound and vibration are at the frontier of progress in many fields, including the healing arts. What do scientists mean by “strings” of energy and what do they look like? Through complex mathematical formulas, physicists theorize that these fundamental strings are incredibly tiny, thin and elastic, like a rubber band. To give you an idea of the size of a string, it is estimated to be about 1033 centimeters, which is about a millionth of a billionth of a billionth of a billionth of a centimeter. These strings can take the form of a loop with a closed end or a strand with open ends. They can twist and wiggle. They can merge with each other and they can break apart. If everything is made up of these basic strings, what is it that makes one particle of matter or one object different from another? It’s all in the way the string vibrates, say physicists. Think of it like this: the basic “stuff” from which everything else is made is like a guitar string. Depending on how we pluck a guitar string, we will hear different notes, or frequencies. According to string theory, the vibrating strings that form the fabric of all matter also produce a number of different notes. But in the microscopic world, these “notes” are various subatomic particles. Which notes (or kinds of particles) we get depends on how the string moves and how much energy accompanies the vibration. For example, a string that vibrates one way is what we call an electron with its specific properties of mass and charge. Another string vibrates in a way that is characteristic of a photon, the particle that makes up light. In addition, the four forces of nature (gravity, electromagnetism, and the strong and weak nuclear forces) can also be explained by the particular pattern of a string’s vibration. The amazingly versatility and flexibility of the string—that is, its ability to give birth to all the variegated phenomena in the universe—is what makes string theory such a good candidate for what physicists call the Theory of Everything (or T.O.E.). Scientists have always had a deep yearning to find the theory that will tie together everything we know about the universe. This is one of the reasons why Isaac Newton’s discovery in the 1600s of the universal principle of gravitation generated such excitement. With one stroke, Newton unified heaven and earth by explaining that the same force (gravity) that makes an apple drop also holds the planets in orbit around the sun. Two centuries later, in the 1860s, James Clerk Maxwell developed four simple mathematical equations that united the concepts of electricity and magnetism by showing their inseparable relationship. He also united our ideas of light and the electromagnetic force by proposing that light was just one part of a larger spectrum of electromagnetic radiation. We now know that light—including infrared (not visible to humans), visible and ultraviolet light—as well as other waves, such as radio waves and gamma waves, are all created by the same phenomena, the interplay of electricity and magnetism. Maxwell’s breakthroughs formed the basis not only of modern electronics but the revolution in physics known as quantum mechanics. Albert Einstein also had an intense yearning to unify and simplify. He spent the last three decades of his life searching for the missing element that would tie together our understanding of electromagnetism and the forces of gravity. For a time, Einstein seemed to be alone in his quest. As he focused his attention on the big picture, others were captivated by the increasingly smaller realm inside the atom. Einstein never fulfilled that dream, and as the years passed, the need for unification only became greater as a growing conflict lurked in the background of science—a conundrum that still leaves physicists scratching their heads. As Brian Greene describes in The Elegant Universe, at the root of this dilemma is a discrepancy between Einstein’s theory of relativity (which revised our understanding of gravity and which works well to describe what happens in the world of the large) and quantum theory (which works well in the subatomic world of the very small). But when you put the two together, they just don’t jibe. In other words, if both the theory of relativity and quantum theory are valid “laws” that govern the universe, they both need to work all the time—and they need to work together. Without delving into the complex mathematical and conceptual ideas behind this, it’s as if there are two alternate versions of how our universe operates. Or we haven’t yet discovered the link in the chain that connects both theories. Scientists refer to this master equation as a “unified theory.” When physicists invoke the word unified, what they are really talking about is the drive to simplify and to harmonize. Both philosophers and scientists will agree that the most important laws of life are, in the final analysis, the most simple. The greatest theory of all would be the one that reduces all that we know about nature and the universe into less (and more simple) principles, perhaps even one principle that would neatly tie everything together. Is string theory—with its oscillating strings of energy as the common denominator—the Theory of Everything? Not everyone agrees it is. Yet there is intense interest in the field, and it is one of the most active areas of theoretical physics, with many well-respected physicists (and billion-dollar particle accelerators) devoted to proving its validity. Beyond the intricate meanderings of physicists, why should we care about string theory or vibration? Does the idea of vibrating energy have anything to do with our everyday life? More and more researchers, health care practitioners and futurists and are answering with a resounding yes. If it’s true that all matter is composed of vibrating strands of energy, so are we. In this scenario, the body itself is literally a symphony of strings. Our cells, organs and tissues vibrate. Billions upon billions of frequencies interact with each other and resonate within us. Just as importantly, those vibrations constantly interact with what's happening in our environment. In short, in a world where vibration reigns supreme, the sounds and vibrations that fill the world outside of us can influence and change the vibrations inside of us, affecting our health and well being for better or for worse. The converse would also be true—the vibrations emanating from inside of us affect and change what takes place in the environment outside of us. Of course, string theory is by no means the origin of such ideas. It is only a very recent adjunct to powerful and long-held principles that have been around for millennia. The principles of vibration and energy flow—and the idea that sound can influence our health—were espoused long ago by ancient sages of many cultures, East and West. To name just a few, Hermetic philosophers taught that one of the seven major principles we should live by is the principle of vibration: everything is in motion and everything vibrates. Chinese healers (and modern acupuncturists) seek to restore the flow of energy (or chi) through the body’s meridians. In the Chinese system, particular healing sounds are associated with one of the five organ systems of the body and can help balance the body and emotions. Hindu, Buddhist and Jewish sages taught that sound, in the form of specific mantras, divine names and prayers, can bring about a host of powerful effects, both external and internal. Pythagoras is said to have used music to heal the body and the emotions. Through his study of vibrating strings, Pythagoras discovered the relationship between tone and the ratio of the strings. He believed that the essence and relationship of all things could be expressed through numbers. The great philosopher also taught about the “music of the spheres.” Pythagoras said that the movement, rhythm and vibration of every atom as well as every celestial body produce a particular sound. Copyright © 2004. Patricia R. Spadaro. All Rights Reserved. 1. Brian Greene, The Elegant Universe: Superstrings, Hidden Dimensions, and the Quest for the Ultimate Theory ( New York: Vintage Books, 2003), pp.15-16. 2. Brian Greene, The Elegant Universe, p. 5. 3. Richard Gerber, Vibrational Medicine, 3d ed. ( Rochester, Vermont: Bear & Company, 2001), p. 65. Copyright © Patricia R. Spadaro. Part 2 of "The Body's Symphony of Sound and Vibration"
In our modern culture, where for many seeing is believing, how do we know that what sages and energy practitioners say about the power of sound is true? Is there evidence that vibration and sound can affect matter, interact with our molecules and stimulate healing? And if so, can we measure their effects? In the eighteenth-century, German scientist and musician Ernst Chladni, known as the father of acoustics, took a step toward answering these questions. He demonstrated, in simple, visual experiments, that sound affects matter. When he drew a violin bow around the edge of a plate covered with fine sand, the sand formed various geometric patterns, as shown below. Another pioneer in this arena was Dr. Hans Jenny. A Swiss medical doctor and a scientist, Hans Jenny realized the importance of vibration and sound and set out to study them from a unique angle. His fascinating experiments into the study of wave phenomena (which he called cymatics, from the Greek kyma, meaning “wave”) provide nothing less than pictures of how sound influences matter. In the 1960s, Dr. Jenny placed sand, fluid and powders on metal plates, which he vibrated with a special frequency generator and a speaker. His experiments produced beautiful and intricate patterns that were unique to each individual vibration (see photographs below). Moreover, these varying patterns remained intact as long as the sound pulsed through the substance. If the sound stopped, the pattern collapsed. For many, these experiments show that sound can indeed alter form, that different frequencies produce different results, and that sound actually creates and maintains form. 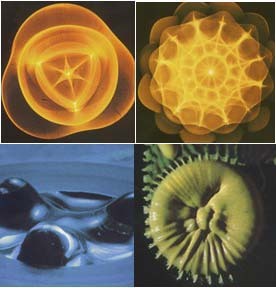 The photographs below are taken from Dr. Jenny's work in cymatics. Used with permission from the two-volume edition of Cymatics: A Study of Wave Phenomena, © 2001 MACROmedia, 219 Grant Road, Newmarket, NH 03857. www.cymaticsource.com. Although best known for his stunning cymatic images, Dr. Jenny was also an artist and musician as well as a philosopher, historian and physical scientist. Perhaps most important, he was a serious student of nature’s ways with keen powers of observation. Whether it was the cycle of the seasons, a bird’s feathers, a rain drop, the formation of weather patterns, mountains or ocean waves—or even poetry, the periodic table, music or social systems—Dr. Jenny saw an underlying, unifying theme: wave patterns, produced by vibration. The implications of Dr. Jenny’s work are vast, especially for the field of healing and vibrational medicine. If sound can change substances, can it alter our interior landscape? Since patterns of vibration are ubiquitous in nature, what role do they play in creating and sustaining the cells of our own bodies? How do the vibrational patterns of a diseased body differ from the patterns the body emanates when it is healthy? And can we turn the unhealthy vibrations into healthy ones? While Dr. Jenny did not focus on the healing possibilities of sound and vibration, his work inspired many whose destiny it was to do just that. Two other researchers who have created visually compelling evidence of the power of sound are Japanese scientist Masaru Emoto and Fabien Maman. Maman, a French composer, acupuncturist and bioenergetician, and Helene Grimal, a biologist, experimented with both healthy and cancer cells to see how they would respond to the voice and to various instruments. In his book The Role of Music in the Twenty-First Century, Maman reports that among the dramatic effects of sound they captured in their photographs was the progressive destabilization of the structure of cancer cells. Maman says that when he played sounds that progressed up the musical scale, the cancer cells eventually exploded. Japanese scientist Dr. Masaru Emoto has shown the potent effects of sound by photographing water crystals. His work is published in his series of books Messages from Water and was featured in the movie What the Bleep Do We Know!? In his remarkable experiments, he played classical music and folk songs from Japan and other countries through speakers placed next to water samples. He then froze the water to make crystals and compared the crystalline structure of different samples. With each musical piece, the water sample formed different and beautifully geometric crystals. When he played heavy metal music, the water crystal’s basic hexagonal structure broke into pieces. Dr. Emoto’s work goes further still. He also measured the impact of words on the crystalline structure of water. The results of Dr. Emoto’s experiments match what psychologists, researchers and spiritual masters alike have shown—that the words we speak and the thoughts we think impact our well-being at all levels. In one experiment, Dr. Emoto and three hundred others assembled at the shore of a badly polluted lake in Japan and spoke aloud an affirmation of peace and gratitude. The water crystals changed from a cloudy and distorted image before the prayer to beautiful, geometric crystals after the prayer. Smaller groups of people have repeated this experiment at other lakes around the world with similar results, which Dr. Emoto has published in volume two of his Messages from Water. In another experiment, Dr. Emoto taped various words and phrases to jars of water. Afterward, he photographed the crystals formed when these water samples were frozen. Words or phrases such as thank you, love/appreciation and love thyself produced a variety of beautiful geometric forms. On the other hand, phrases such as you make me sick or you fool produced crystals that were disconnected or chaotic. The implications of these simple experiments are profound. Since our bodies are made up of 70 percent water, imagine how the sounds and vibrations that fill our external environment affect our internal environment, our very cells. Imagine how the words we speak—about ourselves and others—affect not only our own health but also the health and well-being of those in our lives. First, take a moment and think about the sounds that surround you. • Which are positive and which do you find abrasive? Do you allow yourself intervals of quiet and silence? Do you reserve time for yourself where you control what’s in your air space? • Think about the words you hear from others. Are there any that are consistently negative and that make you unhappy or drag you down? • The sounds of our own discontent can create discontent within others. Think about the words you speak that impact those in your sphere of influence. Where is there room for improvement? • Imagine your ideal sound environment. What kinds of sounds would you include? What sounds would you exclude? Although there may be sounds in your life that you cannot change, you always have some control over what you allow into your environment. Here are five tips and tools you can use to make better sound choices in your life. In our busy lives, we all need to create a no-fly zone—air space that is filled with only the sounds we need. For example, if a family member has the volume on the TV cranked up so that you can hear it two floors above, calmly explain your needs to them. At certain times of the day, ask them to lower the volume or to wear headsets. Put on your own music to take control of the sounds in your life. Be conscious about your sound environment. In today’s society, we are addicted to filling our time and our space with activity. Stores, restaurants, even waiting rooms are filled with sounds that may or may not be what we need. We can easily get into the habit of turning on the car radio or the TV without a second thought. All this can create a sonic overload and prevent us from hearing the still small voice of wisdom within. Try leaving the radio and the TV off at times. Pick restaurants that play the kind of music that is conducive to the emotional environment you want to create. Allow yourself to turn off the ringer on your phone and let messages go through to your answering machine. Savor the silence. Having toxic language in your life will affect your physical, mental and emotional health. If the words you hear from someone (at home or at work) are consistently negative, don’t be afraid to be proactive. Those who are speaking those words aren’t always aware that they are affecting you negatively. Take the initiative to tell them. Speak politely, yet frankly and firmly draw your boundaries. For example, “I appreciate that you feel stressed, but I find that too often hearing that kind of language hurts (or worries, upsets, saddens, depresses) me. It’s unhealthy for me, and I need to ask you to refrain from speaking like that around me." If you do not get the response you need, you may have to limit or eliminate the time you spend with that person. The words you speak aloud—whether they are about yourself, about the events in your life or about others—impact those who hear them, including your children and partner. Learn to pick up the signals others send you. For instance, how does their expression change or what does their body language convey when what you say (or how you say it) disturbs them? Become aware of the reactions of those around you. They can be your greatest teachers. Our words and the tone of those words reflect underlying emotions. Frustrations we don’t deal with in one area of our life can pop out in another area—in our daily exchanges with those we are close to, for instance. When you hear this happening, don’t judge yourself—listen and learn. Gruffness, anger or excessive complaining are alerting us that something is going on under the surface. It can be something that we aren’t aware of, that we aren’t acknowledging or that we aren’t dealing with. You owe it to yourself and those around you to confront the core issue. Try to step back and ask yourself: What is really bothering me? Objectively identify the issue by writing it down. If you can’t name what it is, start by writing down how you feel. Identifying on paper your true feelings or the unsettling circumstances in your life will help you get the real issues out into the open so you can take the next steps to resolution. We couldn’t be more proud of the positive results of our independent studies. A study conducted by the Cognitive Drug Research, a top UK and international cognitive testing and research company, found that all users made an improvement, but those facing challenges from dyslexia, dyspraxia, ADD, ADHD and other learning and behavioral problems improved more significantly using our program for just 10 minutes a day. Short term memory also improved by an astonishing 46% to 73% in our test group, which could have implications for those with dementia and other cases of memory loss. It’s really easy to use The Sound Therapy Listening Program. After your purchase, you simply download the entire program to your mobile phone, tablet or computer and start enjoying the 5 progressive levels of the system. You don’t need to purchase any special equipment like expensive headphones or sound players. The outstanding research results come from the actual sounds, beats and specially embedded tones and not the quality of equipment they’re played on. The Sound Therapy Listening Program is also extremely cost effective. Once you purchase it, it’s yours to own, enjoy and use for life! 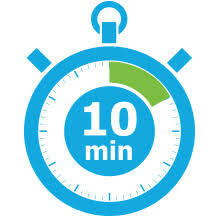 There are absolutely no hidden costs down the road with expensive practitioner follow up sessions or renewal fees. There are easy to follow user instructions with the download and we are always here to answer any questions you may have to get you going or if you have any issues along the way. We’re confident that you’re going to love The Sound Therapy Listening Program. But if you’re not completely satisfied within 30 days, we’ll cheerfully refund your purchase price, no questions asked! Proven to improve learning, focus, concentration, memory and more! Provides relief for stress, anxiety, depression and other emotional issues. Simple to use for children, adolescents and adults. Fast results in only 10-20 minutes each day. Sound therapy is backed by over 30,000 studies and CDR (Cognitive Drug Research company). Affordable price with no hidden extras, practitioner follow ups or renewal fees. You or your children won't get bored with over 40 unique musical tracks. Positive results with users challenged with ADHD, Dyspraxia, Dyslexia, Asperger's and APD. Who Is Behind The Sound Therapy Program? Firstly, thanks for visiting the site and please mail me direct if you have any questions regarding the program or general learning. Between myself and the team we have a wealth of knowledge that covers over 25 years of studying the effects of sound and music upon the mental, emotional and physical body. The quest for that knowledge has taken me from the UK to Africa, India, Nepal, Europe and the USA gaining insight and knowledge from some truly amazing experiences and people I have met along the way, both esoteric and science based. Aside from my love of learning it has got to be the feeling I get when I hear from parents seeing their child progress and embrace a renewed sense of self worth, which often leads to a happier child and therefore a happier family, I mean what can be a better buzz. To be honest I do the work because I have personally overcome many of the obstacles that a lot of children and adults face today including dyslexia and spacial awareness issues that have been a challenge to say the least. Having done the research I use various auditory techniques and strategies for learning that have enabled me to focus, relax the mind and absorb information in a way that works for me. This culminated in a very proud moment when I gained my Masters degree in 2000, and some would say "against all the odds". Any sound therapy products shown on the site are not a substitute for contacting your local GP.